It’s been six weeks since I was in New York for #BlogTourNYC. Hard to believe, and I’m already planning a return for meetings (I’m a city girl at heart). This time I’m bringing a few friends so we can fit in shopping, shows and sipping “champs” (in Macy’s shoe dept). Not that I wouldn’t do it without an entourage of my nearest and dearest. One more trip is planned before the summer, and my job as a personal chauffeur for the Fashionista begins i.e. shuttling her to and fro, she has etiquette classes scheduled (you never know when you’ll have lunch with the Queen), more riding lessons, jazz dance, and a weeks retreat in the Thousand Island region of Upstate New York. Now that she’s old enough, I want her to experience an area where I spent most summers during my formative years (when we weren’t vacationing in Maine). I’m even going to rent a boat (yes, I can drive a boat and I know the visual of me doing so is pretty horrific). I can only hope that my aging eye-sight is good enough to see the channel markers. I’ll be sure to share pictures of the home that we are staying at, it belongs to friends, and it is FABULOUS. When they offered it to me for my vacation, I had a total “pinch me” moment. With six bedrooms, wrap-around porches, boat house, Chef”s kitchen, panoramic views from all sides (it’s on an island) and all of life’s luxuries at my disposal, I am positively giddy. Okay, so I won’t be relaxing by the water in my steamer chair for the entire 7 days, the house is going to be featured in a national magazine (as it should be). I will be partially busy co-writing the article while keeping my daughter out of the way of photographers. The Fashionista’s first reaction was “Does it (the house) have spiders?” followed by “Are they going to have ice cream?” While I can guarantee spiders, the ice cream is going to be a little challenging, since we are two miles by boat from mainland. 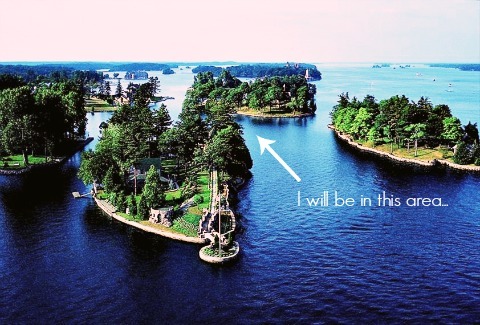 So why am I talking about New York and the Thousand Islands? Because while we were in New York we met with one of our #BlogTourNYC sponsors-Blanco. Coincidentally, my friends have a Blanco sink in their cottage kitchen. Not surprising, because I can’t imagine them having anything less than “one of the best”. They sent some photos of the “cottage” to me, and I sent back a list of questions for the article, one of which I asked for the brands used in the kitchen. The sink? “Blanco.” Not surprisingly, this company has served as a “muse” for many discriminating consumers. A moniker that is well-deserved. With the evolution of kitchen design, homeowners continue to crave open spaces, and kitchen fixtures which are “optimized” for open floor plans. My friends knocked out a wall last year to open up the kitchen at the “cottage”, which explains the well-thought out and visually appealing appliances. 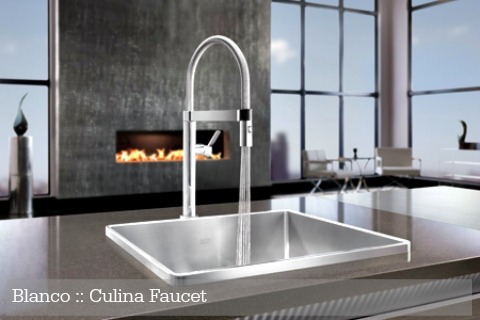 The need for sophisticated kitchen appliances, sinks, faucets and hardware becomes a necessity when the kitchen flows into other living spaces. 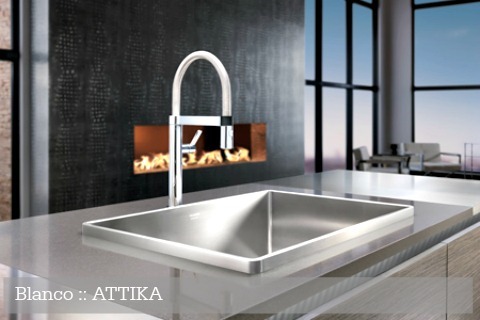 Blanco has created a line of sinks that show true artistry which can only be described as “steel art” for the kitchen. As with the summer “cottage” or open living plans, a design should not be compromised by using anything less than products that create a sense that art is truly imitating life. 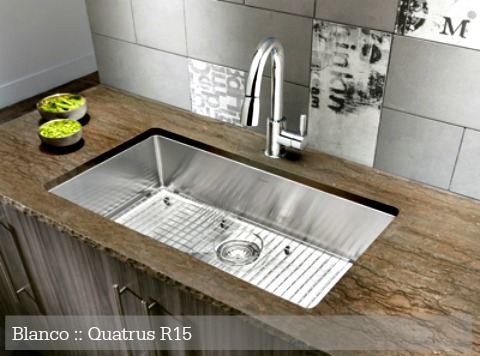 This stainless steel sink features a raised geometric rim with soft edges and a stain polished finished. Elegant & sophisticated. 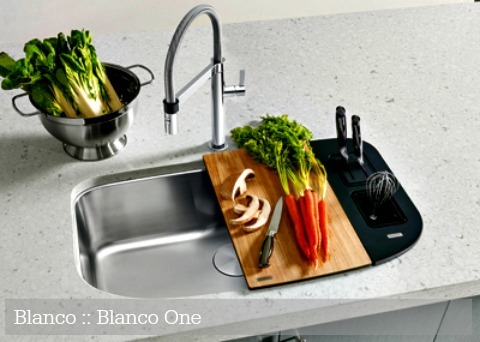 Blanco One, lets you customize the features to create a personal workstation. I love the fact that everything is retro-fitted to the sink so everything is at hand for food prep. 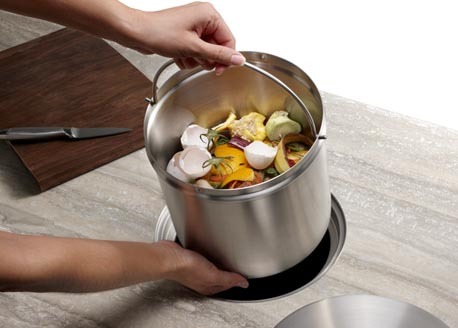 Blanco’s Solon Compost System sits below the countertop and is airtight. My personal philosophy is that”we should always put back into the earth those things that we take out,”and Blanco’s Composting System allows you to do just that. As always don’t forget to follow us on Pinterest, Instagram, Facebook & Twitter for more design inspiration.